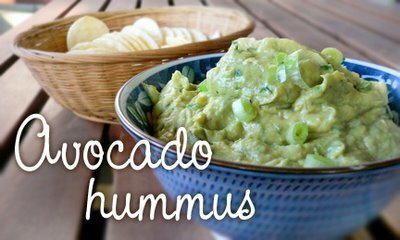 Sometimes guacamole is just too good with all that healthy fat... so to lighten things up and add a twist to the same old hummus, try this crazy combo! It's creamy yet light. Cut the avocado in half, remove the nut and scoop out the flesh into a blender or food processor. Add the garbanzos, olive oil, water, lemon juice, garlic, salt or Bragg's, cumin and thyme. Process until nice and smooth. Pulse or stir in fresh chopped cilantro, green onion and tomato. Spoon into a pretty bowl and serve with rice crackers, tortilla chips or pita triangles. I prefer "guacummus", rolls off the tongue easier than "hummusomole". Hmmm, you might be right. Thanks Greg! I've added it to the title.